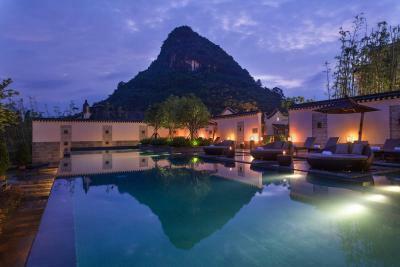 Lock in a great price for Banyan Tree Yangshuo - rated 8.6 by recent guests. Rooms were expensive and service was poor for a 5 star hotel. The setting of the hotel is good. The staff are helpful and try to do their job. Very comfortable room and bed. Lots of space to enjoy. Small gift left on pillow was nice touch. 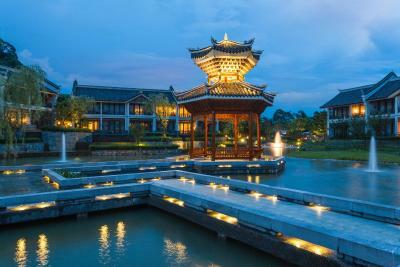 The hotel itself is really beautiful and staff was helpful. Breakfast was really good (we had bubbly breakfast during our stay, not sure if that's common). Room is spacious. We went in really cold weather, but I think during warm weather, the self guided bike tour near the hotel would be super nice. 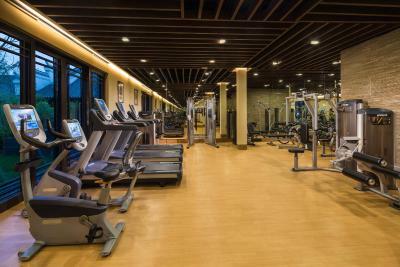 the gym was nice too for those who like to exercise during their holidays. 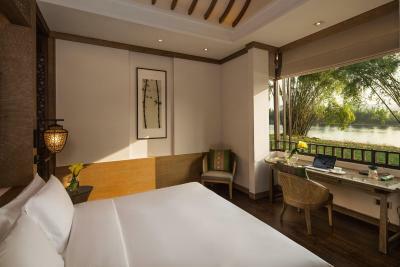 The hotel is located near a river and is well decorated. Totally a different world compared with outside of the hotel. It's quiet that you can hear the birds tweeting. 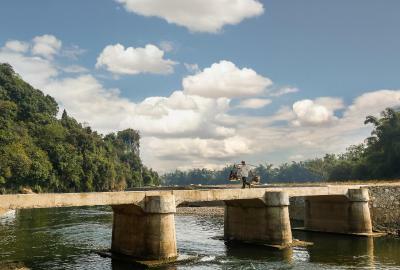 Very peaceful place with fresh air after night. Room service is very detail-minded. They even come to do some tidy up when we go out for dinner. btw, it takes 30 mins drive to city centre for meal. Very quiet and away from city hence travel to city about 30mins. I like the bamboo rafting ride. 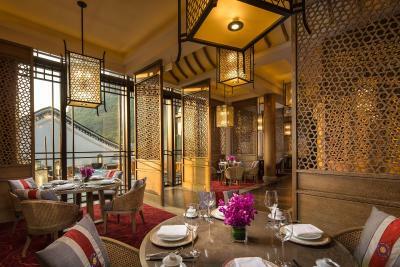 I also like the Flower tea and the breakfast. The staff was awesome. View is awesome. We had a great time doing bamboo rafting at the hotel. Our family join the cycling class offered by the hotel, the fresh air and the view is just breathtaking. Breakfast was good with alot of choices. 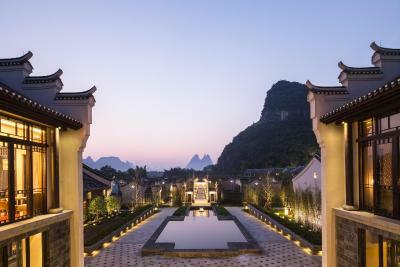 One of our top picks in Yangshuo.Featuring an escape in the nature, Banyan Tree Yangshuo is located in Fuli Town, a 20-minute car ride from West Street and downtown Yangshuo. 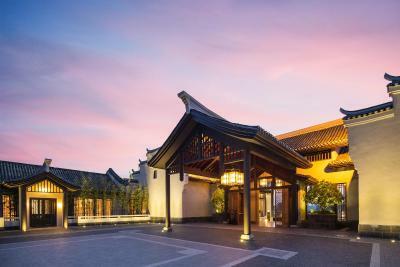 It offers an outdoor swimming pool, a spa centre, an array of activities, landscaped gardens and 4 on-site dining options. 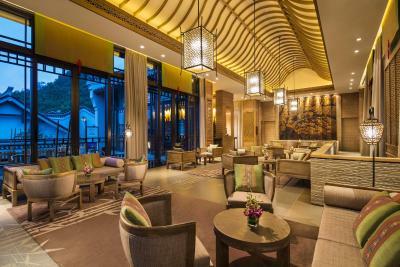 Free WiFi is provided throughout the entire property. 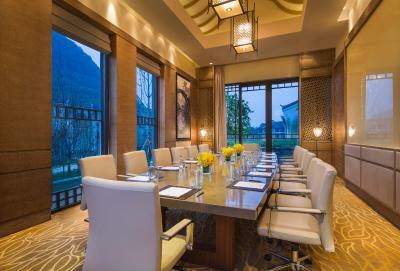 Banyan Tree Yangshuo has been welcoming Booking.com guests since 17 Jul 2014. 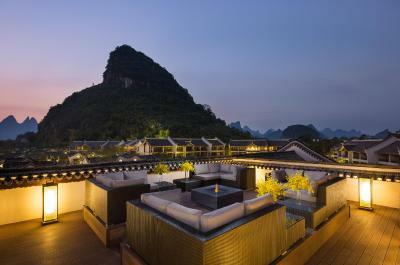 When would you like to stay at Banyan Tree Yangshuo? 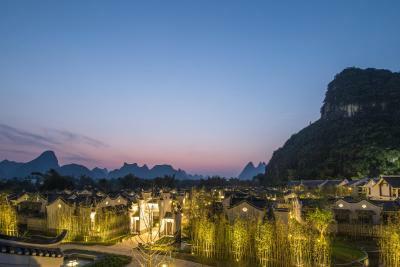 Tranquil and delightful, this private living space puts the magnificent view of the unique Karst mountain on full display. 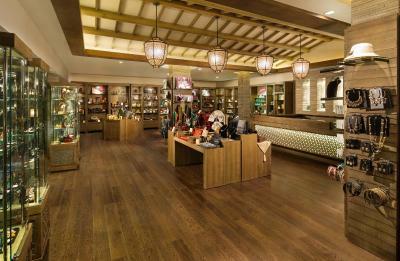 Natural light fills the room as you slide open the wooden doors. 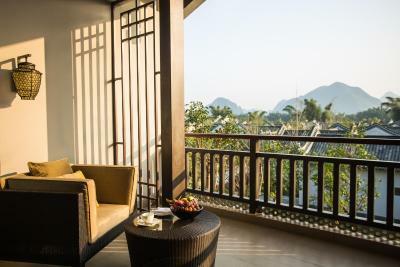 Experience serenity as you unwind at your balcony. Enjoy the fresh air all day and relax on the balcony, as you take in the stunning views of the lake and the mountain from the unit. 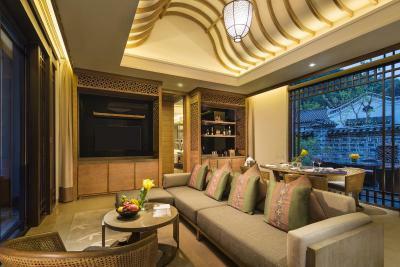 This suite comes with twin beds, a spacious bathroom and a deep soaking bathtub. 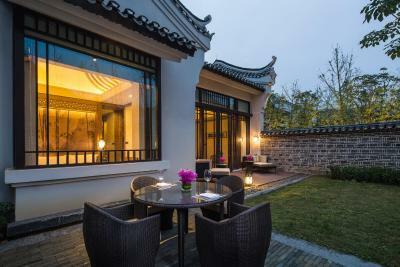 Experience refined countryside living in a beautifully appointed one-bedroom Garden Villa with a private garden. 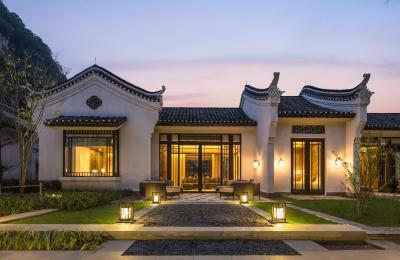 The spacious 108-square-metre villa features a bedroom with a separate dressing room, a view of the Li River and a king-sized bed. 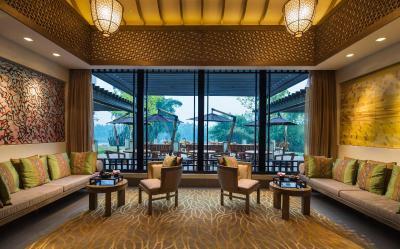 The spacious bathroom comes with dual vanities and overlooks the rainforest in the surroundings. This villa offers captivating sights of the Li River. 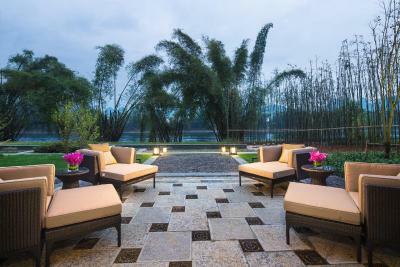 The spacious living area leads to a 200 square meters manicured garden, surrounded by gorgeous bamboo shoots. 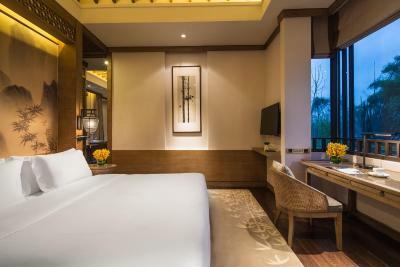 The bedroom features a separate dressing room, a view of the Li River and a king-sized bed. 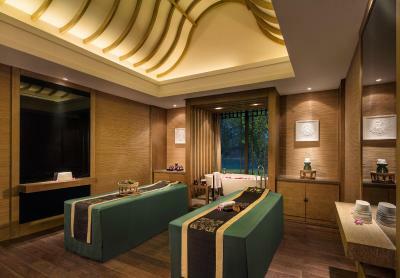 The spacious bathroom comes with dual vanities and overlooks the rainforest in the surroundings. 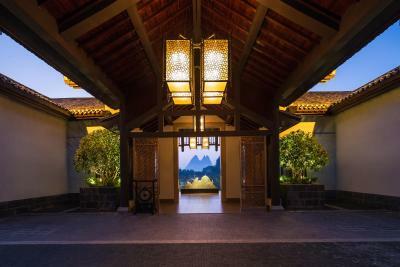 Offering magnificent views of the Li River and the mountains, this 138-square-metre villa offers a manicured garden, surrounded by gorgeous bamboo shoots. 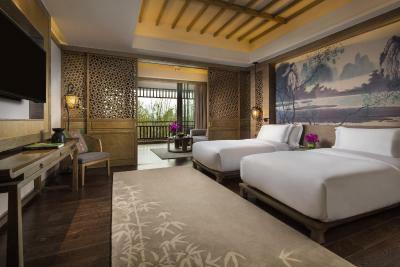 The bedroom features a separate dressing room, a view of the Li River and 2 separated bedrooms. The spacious bathroom comes with dual vanities and overlooks the rainforest in the surroundings. 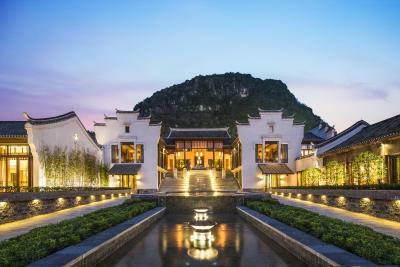 Offering magnificent views of the Li River and the mountains, this 246-square-metre villa offers a manicured garden, surrounded by gorgeous bamboo shoots. The bedroom features a separate dressing room, a view of the Li River and 3 separated bedrooms. The spacious bathroom comes with dual vanities and overlooks the rainforest in the surroundings. Enjoy the fresh air all day and relax on the balcony, as you take in the stunning views of the lake and the mountain from the unit. 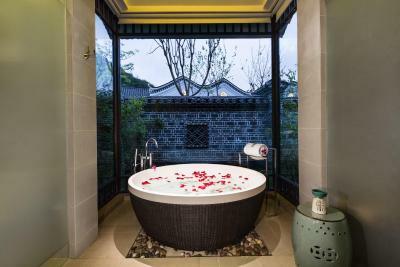 This suite comes with a king bed, a spacious bathroom and a deep soaking bathtub. 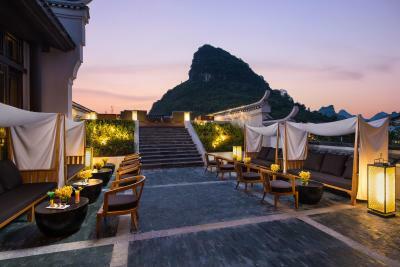 House rules Banyan Tree Yangshuo takes special requests - add in the next step! 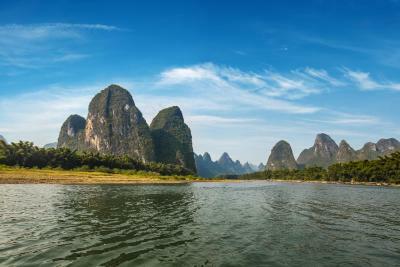 Bankcard Cash Banyan Tree Yangshuo accepts these cards and reserves the right to temporarily hold an amount prior to arrival. 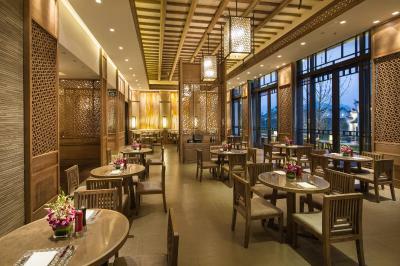 Banyan Tree Yangshuo accepts these cards and reserves the right to temporarily hold an amount prior to arrival. The hotel management is so poor. The power was down five times at night. Every single time the power was down, there was a flashing light in the room waking us up. And then entire room would light up when the power was back on. So we were awaken five times during light. Also the kids play room was deserted. There was a broken toy inside the ball pit. My daughter was wounded and got a big cut on her finger. 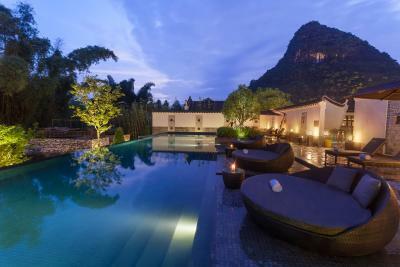 The hotel was nothing like banyan tree but the name. The staff are ok but the management snd operation system may need a review. For example check in and check out took a long time. Many of its services are not becoming of a five star institution. There is a sort of tea/ happy hour. No coffee or tea were served. They cost rmb58. Drinks were limited. soda water comes in a pre poured glass. Not even peanuts or chips. Just a few not very appetising cakes. Breakfast is fine except there is no cutlery at the table. One has to ask for knife and forks. Grouting on bathroom floor needs to be retouched. Looks tired. 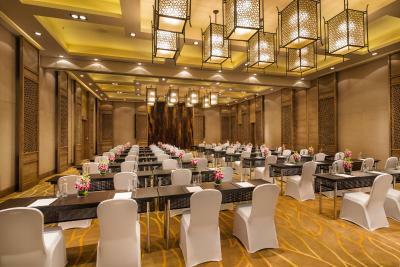 Very good environment and excellent service. Very big room and comfortable bedding. All the staff I met were caring, polite and professional. The restaurants there were also good and the breakfast had lots of choices. They also had some interesting activities which you can stay all day in the hotel, especially good with those with kids. 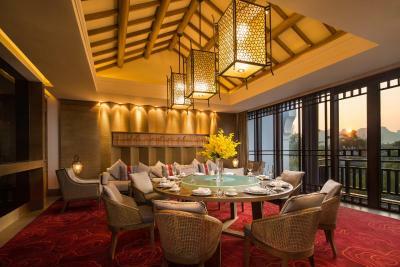 Banyan is great for a getaway if all you are doing is staying in the hotel. 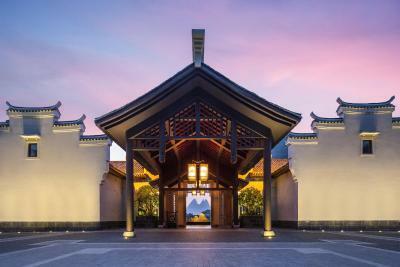 The hotel isn't close to the city (15-20min cab ride min) and we had difficulty calling didi (local uber) from Banyan into town, so you have to rely on the shuttle if you want to get in and out of the resort, or you pay for the hotel to arrange car for you. 1. 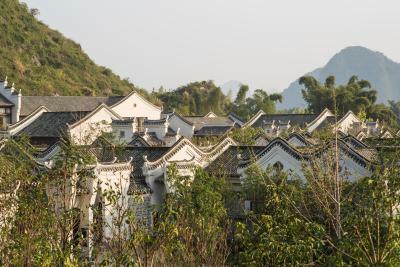 Yangshuo city is under construction, very dusty......construction work almost everywhere.... 2. I booked a two bedroom villa. When I checked in, the reception staff told me there's a construction work going on in front of my villa. So I barely see any river view from my garden....AND the construction work is NOISY. After checking with other staff, the receptionist told me the construction work is from 9am to 6pm...which is unexpected and annoying. 3. One of the toilet is smelly... 4. We waited 10-15 mins for a breakfast seat... 5. spa is already fully booked for that day when I check with reception at 5:30pm 6. The receptionist is not that helpful. it seems that she is not familiar with the hotel. Not much activity within the property . I booked a one bedroom villa. On the first night everything was OK. The air conditioner worked fine. 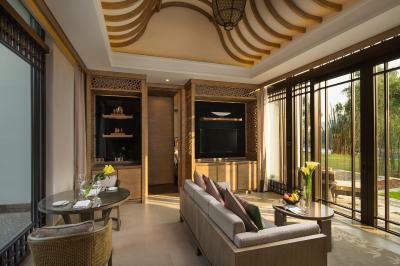 There is a temperature setting for each of the rooms (bed room and living room ). The next day was quite a sunny warm day (about 25 degrees). When I arrived back at the hotel in the afternoon the curtains were fully opened letting all the sun into the rooms which made the rooms quite hot. To add to this the housekeeping staff turned the air conditioners off. I turned them back on only to find out later that using the temperature controls was useless because management controls the cooling and heating for all the villas and rooms. Management decided to switch to heating mode which meant the rooms were extremely warm. I require the room to be quite cool to get a good nights sleep and they couldn't switch it back to the way it was. I complained about this but was useless complaining. They gave me a couple of fans however given the fact the room was warm meant warm air was being blown around. I couldn't sleep properly for the next two nights. So when I checked out I still had to pay the full cost of the accommodation. 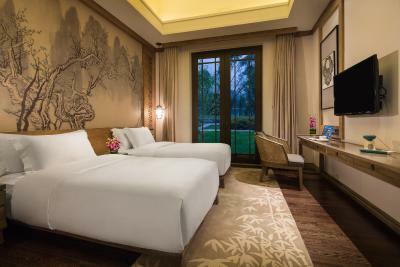 I WILL NEVER AGAIN STAY AT THIS PROPERTY OR ANOTHER BANYAN TREE PROPERTY AGAIN AND WILL TELL MY FRIENDS OF MY EXPERIENCE SO THEY DON'T BOOK ACCOMMODATION AT THE BANYAN TREE AGAIN. 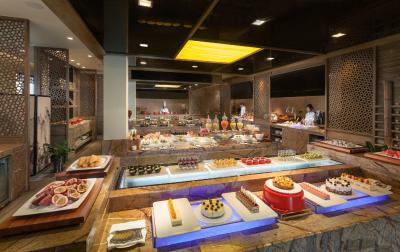 Breakfast was great with quite a variety of food. 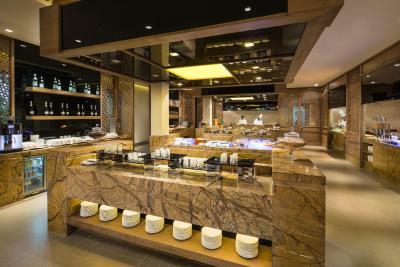 The staff (excluding management) were very good. 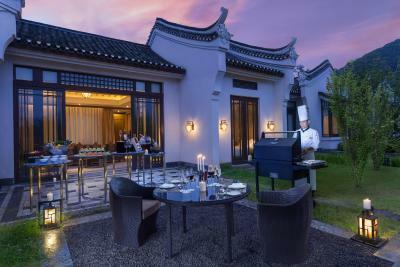 The location of the Banyan tree is close to all the other sight seeing places. As we were unable to access the internet we were unable to view "things to do" in the area, my suggestion is that the hotel could provide more information for those people who were unable access the internet. Air conditioner is just like a cosmetic installation. No heater at all. The coffee could be better. Could be better if the shuttle to town is more frequent. The cleanliness of the room 5/10, they did not clean my room at all, we checkin the hotel at 1pm and left for our scheduled activity. They had atleast 2-3 hrs to clean the room, but did not there were dust and insects all over the floor and bathroom. I asked the hotel to have them clean while we went out for bamboo rafting, came back having the room in same condition. I was sneezing so bad that I had to give them a 3rd call to let them know about this, waited for more than half hour and 2 more calls before housekeeping came. She came in with a mop and stormed right to the balcony and started mopping from outside? to inside... I do not want to say more on how she cleans.